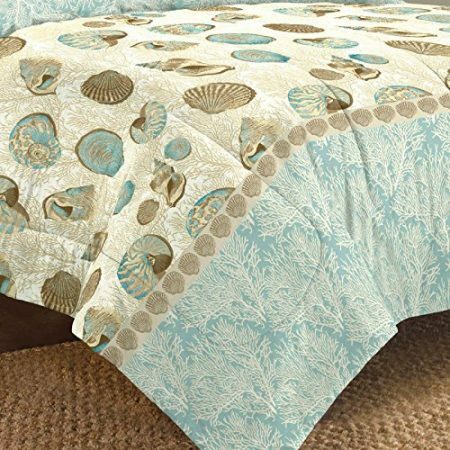 Get this Sea Breeze Seashell Themed Bed in a Bag Set, which includes a variety of pieces. The bedding set has a seashell pattern with a variety of beach elements. 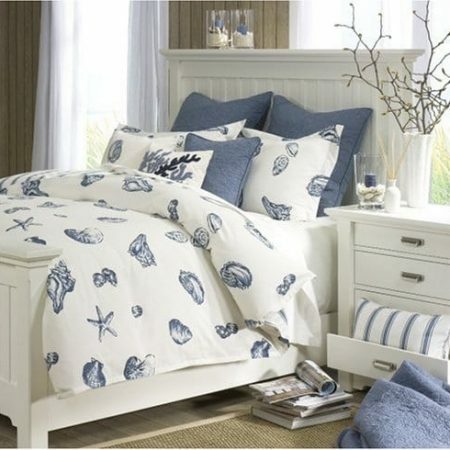 Build your own coastal retreat right in your bedroom with the Sea Breeze Mini Bed in a Bag Set by CHF. 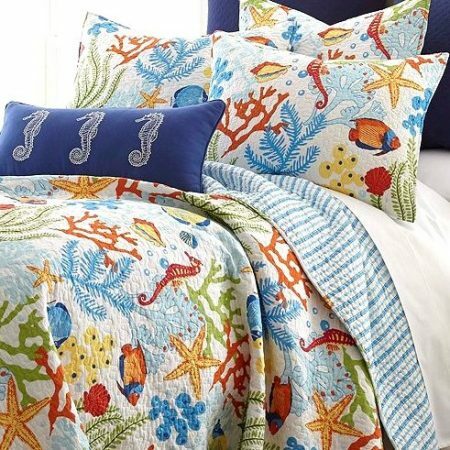 The nautical bed in a bag set includes a reversible comforter, two pillow shams (one with twin), and a coordinating sheet set. 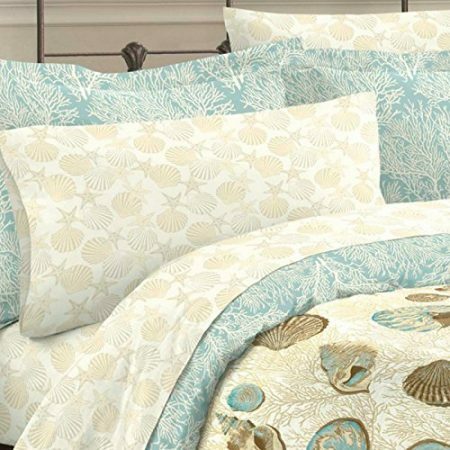 Shells and coral in a soft ocean blue, sand beige, an ivory color palette make this bedding set perfectly tranquil. The comforter reverses to an all-over ocean blue and ivory coral and the coordinating sheets come in a tonal beige shell pattern. Pieces are machine washable and come in popular size options. 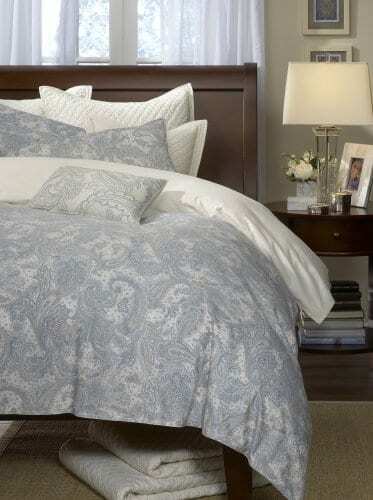 Twin Set Dimensions:Comforter: 86L x 64W in. Sham: 26L x 20W in. Pillowcase: 30L x 20W in. Fitted sheet: 75L x 39W x 10D in. Flat sheet: 96L x 66W in. 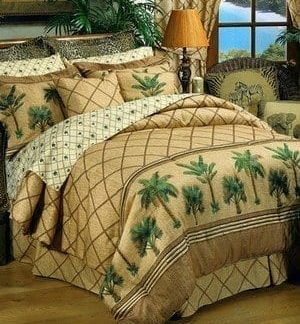 Full Set Dimensions:Comforter: 86L x 76W in. Sham: 26L x 20W in. Pillowcase: 30L x 20W in. Fitted sheet: 75L x 54W x 10D in. Flat sheet: 96L x 81W in. 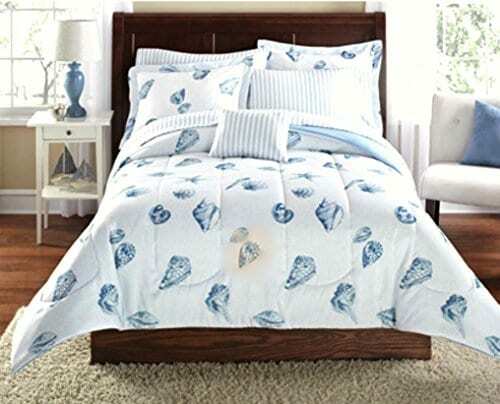 Queen Set Dimensions:Comforter: 96L x 90W in. Sham: 26L x 20W in. Pillowcase: 30L x 20W in. Fitted sheet: 78L x 80W x 10D in. Flat sheet: 102L x 90W in. 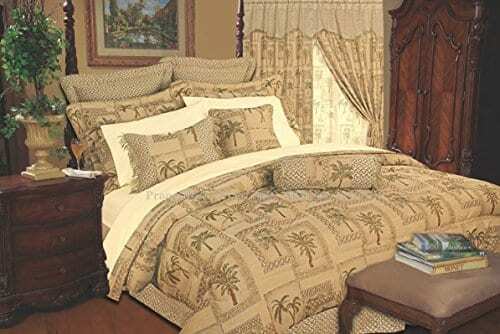 King Set Dimensions:Comforter: 96L x 108W in. Sham: 26L x 20W in. Pillowcase: 30L x 20W in. Fitted sheet: 80L x 60W x 12D in. 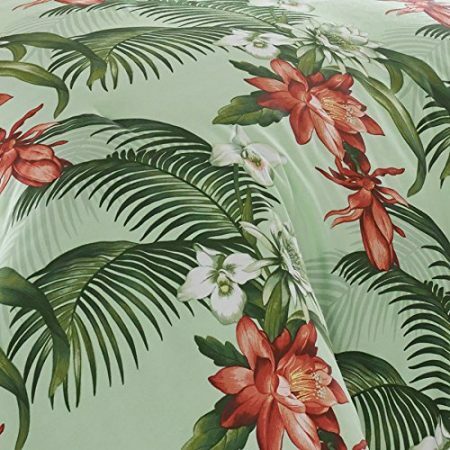 Flat sheet: 102L x 108W in. 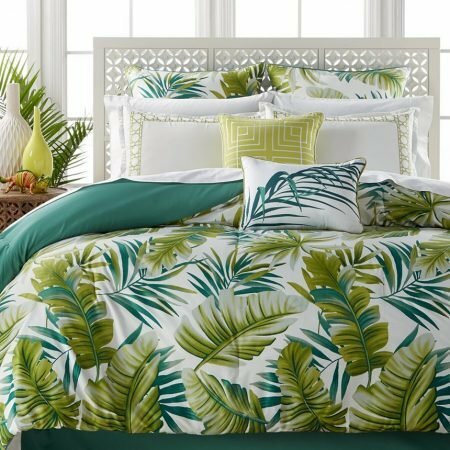 About CHF Industries CHF Industries, based in New York, is known for its home textile products and is the largest private-label supplier of retail-specific bedding products. CHF offers a diverse range of window products like panels, valances, shades, kitchen tiers, and even window hardware. CHF innovates with fashionable solutions such as energy-efficient interlined window panels, taking steps to introduce organic products to protect the environment. Choice of size. 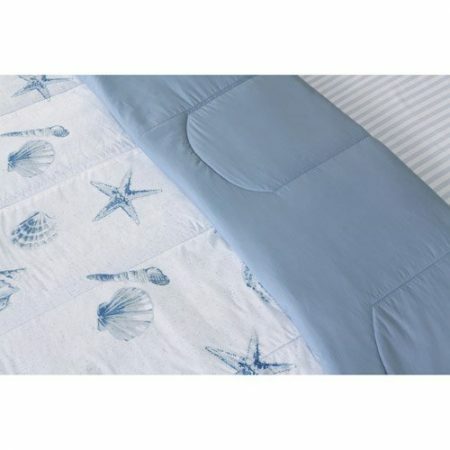 Comforter, 1-2 pillow shams, fitted sheet, flat sheet, 1-2 pillowcases. 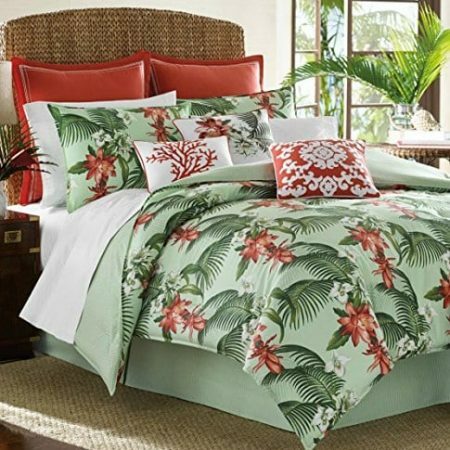 180-thread count, 60% cotton and 40% polyester construction. 100% polyester fill. Shells and coral in ocean blue, sand, and ivory. 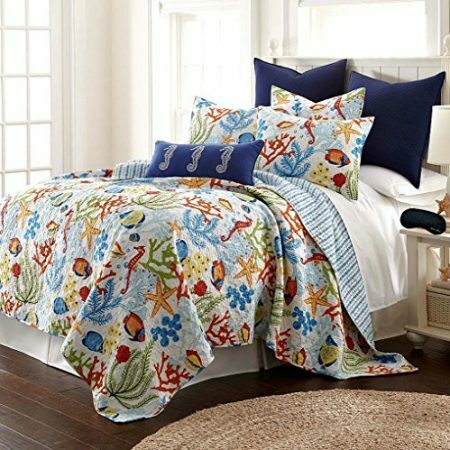 Comforter reverses to blue and ivory coral. 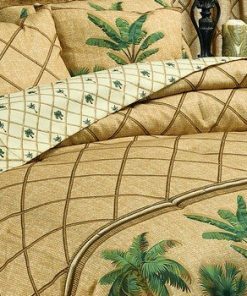 Sheets in tonal beige shell pattern. Machine-washable.